Dr Ron Sharpe was one of the key scientists involved in developing BCAider expert system. Dr Sharpe graduated with BEng (Civil, Hons I) Melbourne University in 1964. He then completed a MEngSc in 1966 at Melbourne University followed by a PhD in Civil Engineering at Southampton University in 1968. He then joined CSIRO Division of Building Research, Melbourne in 1969 to undertake systems research and computer modeling for the building, construction and infrastructure industries. This led to the development of the mathematical model called TOPAZ which was widely applied in Australia and overseas to various urban, transport and building planning resulting in major cost savings. In 1984, he started a research program with five other scientists to apply artificial intelligence techniques such as expert systems and neural networks to improve building industry efficiency. After several successful expert system developments for industry, BCAider was produced in 1991 to help building designers and regulators apply the Building Code of Australia and the achievement was recognised with sseven awards. 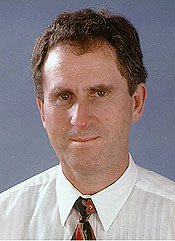 In 1992, Dr Sharpe was made a Chief Research Scientist and Program Manager of Construction Systems as a result of BCAider and other achievements. He held this position until retiring from CSIRO in 2000. Sharpe R, 2008, Personal communication.